Gluten free. Whole grain. Clean ingredients. No refined sugars. No added salt. No artificial anythings. Non-GM. High fibre. Vegetarian Society approved. Kosher - KLBD.Pure pleasure Pure oats really are pure. They're kept separate from other grains to avoid contamination with gluten. Even if you're not intolerant to gluten, it makes sense to give your body a holiday from the stuff. These oats retain all their taste and nutrition. They're simply puffed up and drizzled with honey. Kick back, and let the sweet, nutty oat flavour float over you. Avenin - gluten's nicer cousin Some people can't tolerate gluten. But oats don't contain gluten. They contain avenin, a similar protein that most coeliacs (gluten-intolerant people) can digest. So they're a great way to get grain-based nutrition and delicious taste without maxing our bodies out on gluten. Honey - 200 000 flowers' worth It takes about 5 million visits by bees to flowers to make a single kilogram of honey. So there's about two hundred thousand visits in this box, which makes us tired just thinking about it. Bees. Where do they get their energy? Oh, yes. Same place you're getting it. 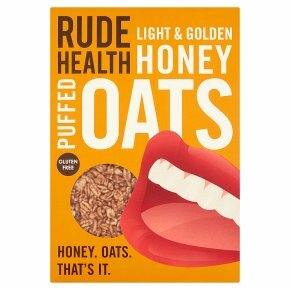 How we like them We like our Honey Puffed Oats in an alternative to milk. Our Almond Drink is deliciously decadent, while our Brown Rice Drink is a nice simple foil. Mix into a soft muesli or crunchy granola for a lighter start to the day. Make a lighter energy bar that will sustain you on the go, and won't sink you, if you're swimming the channel. For the love of oats Double down on the oats: pour our Oat Drink over your oats. Double down on the honey: add a handful of Honey Puffed Oats to Honey Multiflakes, or any of our granolas, which are all baked with honey.